Includes False Creek Mini Ferry, PVA CoolingTowel, LuggageTag, Beaver Badge, 2018/19 Calendar, National ParkAdmission and Vancouver Night Tour (per twin room;night tour is complimentaryto max. 2 guests per room; subject to availability; while supplies last). Exclusive! Bonus Mini Ferry Ride to Granville Island. Exclusive! All Inclusive Meal Arrangement available, including a premium lunch at renowned Chateau Lake Louise. Don’ miss the opportunity to capture more of the Rockies by reserving First 3 Rows during the Rockies tour! Unique Experience Exclusive! Spend one memorable night at the grand 4 star Prestige Salmon Arm (subject to hotel availability). Exclusive! Enjoy a spectacular Whale Watching tour to discover marine habitat, killer whales, humpback whales and more! Day 1: Hometown - Vancouver：Bonus Complimentary City Tour! (duration: approx.3.5 hrs; meet our tour guide before noon): Downtown, Stanley Park, Canada Place, Vancouver Convention Center and Olympic Cauldron etc. Bonus Mini Ferry Ride to Granville Island! Depart for Vancouver Island by BC Ferry. Capture the beautiful scenery along the Georgia Strait. Pass by Chinatown, explore Victoria’s Inner Harbour (optional carriage tour available). Visit the Empress hotel and discover BC Legislative Buildings. After touring Thunderbird Park, Beacon Hill Park, stop by the remarkable Mile "0". 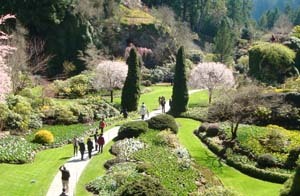 Enjoy the memorable scenery at Butchart Gardens, a breathtaking National Historic Site built from a limestone quarry in 1904. 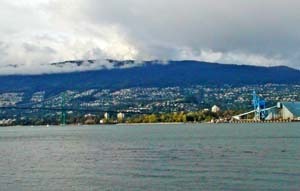 Return to Vancouver by ferry, or by seaplane (surcharge applies). 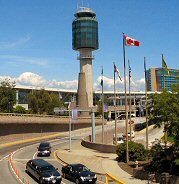 Start our journey via the Trans-Canada Highway; pass through Fraser Valley, and head east to Kelowna, the heart of the Okanagan Valley and home to world-class wineries. At Lake Okanagan, search for the lake monster “Ogopogo” from the First Nations’legendary history. Enjoy moderate wine tasting of the certified organic ice wine, red and white wine at the most visited winery and vineyard in Kelowna. 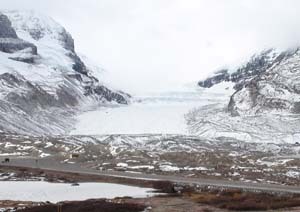 Arrive at Canada’s oldest National Park - Banff National Park via Rogers Pass and Yoho National Park. An eye-opening Gondola Ride (adm) will captivate you with the majestic views of the Rocky Mountains. Passing by Vermilion Lakes, visit Bow Falls which was also featured in 1953 Marilyn Monroe starred movie River of No Return. Stroll along Banff Avenue where you will find myriad of art galleries, trendy shops and boutiques in the highest town of Canada. Start the journey along the Sea to Sky Highway. Pass by Horseshoe Bay, the 3rd highest waterfall in BC, and the world 2nd largest granite monolith - Stawamus Chief. Arrive at Whistler- the #1 ski resort in NorthAmerica and the host of the 2010 Winter Olympics. 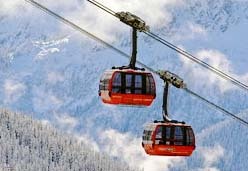 Take the amazing and world recordbreaking Peak2Peak GondolaRide up between Whistler and Blackcomb Mountains (optional). Relax and shop at numerous boutiques at the alpine village. Return to Vancouver by tour bus, or by seaplane (surcharge applies). *Suggested departure flight time after 9:30pm. 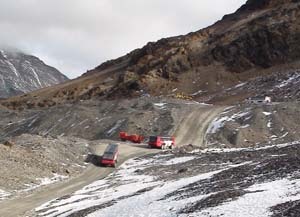 We are not liable to any delays caused by weather, road conditions and other circumstances. Admission fee included: Gondola; Skywalk; Ice Explorer; National Park; BC Ferries; Butchart Gardens. Nestled in the Canadian Rockies, Banff is a town that makes you feel at home and exhilarated with wonder all at the same time. Experience the authentic and vibrant community, modern amenities and beautiful surroundings of the Town of Banff.